Any passport which has been materially changed in physical appearance or composition, or contains a damaged, defective or otherwise nonfunctioning electronic chip, or which includes unauthorized changes, obliterations, entries or photographs, or has observable wear and tear that renders it unfit for further use as a travel document may be invalidated. So even though your destruction of the RFID chip leaves you with a perfectly normal old-style passport, that’s not how the State Department sees it. You have a mutilated passport which may be invalidated, leaving you without travel papers until they give you a new one. You’d think you had the right to control how electronic your passport will be, but that’s not quite the case. Privacy is the claim of individuals, groups, or institutions to determine for themselves when, how and to what extent information about them is communicated to others. So how does this get expressed in the world of social networking? Two recent publications give a good , though I suspect not exhaustive, overview. The European Network and Information Security Agency (ENISA) prepared a position paper on “Security Issues and Recommendations for Online Social Networks” (pdf). The International Working Group on Data Protection in Telecommunications, composed mainly of European privacy officials, has issued a “Report and Guidance on Privacy in Social Network Services” (pdf) A few examples from these highlight the idea that privacy is more than just secrecy. ENISA identifies the problem of “Digital Dossier Aggregation.” Data can easily be taken from social networks and placed in a different context — it can be easy to build a profile of a person that is not controlled by that person. Further, social networks collect your browsing information — who you click on, who you interact with — and often don’t discuss what uses they put this information to. These are both common privacy issues: that users may lose control of their data and that data is being collected and put to secondary uses. ENISA also identifies two risks which I had not considered previously. Facial recognition algorithms will be able to be deployed on social networks, and allow automatic identification of individuals and linking of several profiles. Semi anonymous online dating profiles will be able to be automatically matched with non-anonymous images elsewhere online. Extracting other information from images will allow algorithms to determine what people are doing (such as drinking) and maybe even where. Lastly, ENISA also identifies the difficulty of account deletion as a privacy risk. Facebook users have complained about how difficult deletion can be. This is another way in which controlling your data is important. ENISA even goes one step further, and proposing that social networks make profiles “portable” so that users can easily move from one network to another — promoting competition and user control, and alleviating the other threats which come from the centralization of data. The report contains other issues, such as stalking, spam, and even corporate espionage. Read the whole thing. The Working Group notes some of the security concerns that ENISA focuses on, but also mentions other privacy issues. The first is that online data is usually permanent — it is hard to erase. Even once the data subject deletes the data they control, cached copies may exist, or other services may have duplicated the data. Secondly, the intimacy of the relationships online may be illusory — and sometimes exclude key players. One’s “friends” on social networking sites are not necessarily real friends. I’ll add that the social nature of the site, as well as its communications (talking about your friends, your networks, and who can see your data) covers up the fact that the service operates as a Big Brother, watching and collecting all your activity online. This data collection — of your browsing history and other activity — raises other issues, as this data may be accessible to law enforcement and intelligence services. The data will also be used for marketing and other secondary uses that may not be clearly specified by the social networking service. Further uses may be employers or others interested in researching the reputation of individuals. Lastly, a new development is the creation of application programming interfaces, or APIs. These allow even more third party access to data, often in a way that is hidden. I’ve previously blogged about the privacy and civil liberties issues with law enforcement created applications. You can read there for the specific problems on the Facebook platform. But the general problem is that third party access is being increased in ways which are not transparent to users. The discussion above should clarify what people mean when they talk about social networking privacy. It is not just a matter of “keep things secret.” For some steps on how to deal with these issues, I again recommend you check out the two publications. “Report and Guidance on Privacy in Social Network Services” (pdf). “Security Issues and Recommendations for Online Social Networks” (pdf). Facebook Applications: Back Doors for Law Enforcement? Via Google News I hear of a new Facebook Application: GMP Updates. 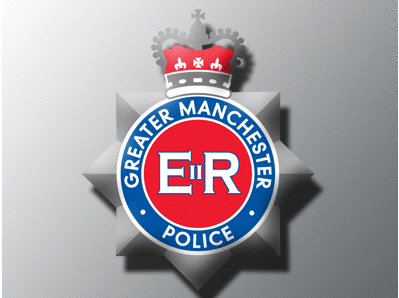 The application, also known as “The Greater Manchester Police Updates,” gives you a feed of crime updates and links to a form for reporting crimes, according to the article. It’s the first time I’ve seen a law enforcement based Facebook application. There have been several articles about law enforcement using its normal user-level access to Facebook for criminal prosecutions (For example: “Facebook Helps Law Enforcement“, “Site Used to Aid Investigations,” “Student Arrested After Police Facebook Him“). In these cases, law enforcement or their tipsters browse Facebook like a normal user, looking at the information made available to that user. The Facebook Site Information may include, without limitation, the following information, to the extent visible on the Facebook Site: your name, your profile picture, your gender, your birthday, your hometown location (city/state/country), your current location (city/state/country), your political view, your activities, your interests, your musical preferences, television shows in which you are interested, movies in which you are interested, books in which you are interested, your favorite quotes, the text of your “About Me” section, your relationship status, your dating interests, your relationship interests, your summer plans, your Facebook user network affiliations, your education history, your work history, your course information, copies of photos in your Facebook Site photo albums, metadata associated with your Facebook Site photo albums (e.g., time of upload, album name, comments on your photos, etc. ), the total number of messages sent and/or received by you, the total number of unread messages in your Facebook in-box, the total number of “pokes” you have sent and/or received, the total number of wall posts on your Wall™, a list of user IDs mapped to your Facebook friends, your social timeline, and events associated with your Facebook profile. Note that applications can access your data even if you’ve marked it as not viewable by the police in your geographic network or school. Even if you’ve used a “friend list” to restrict who sees a photo, it’s still available to the third party application providers. 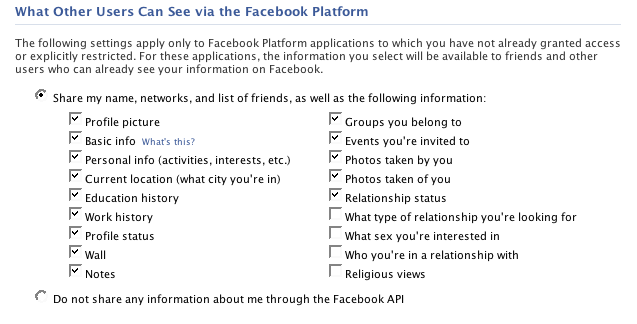 So its not enough to carefully tune your privacy vis-a-vis other Facebook users. You also have to avoid adding in applications like the GMP Updater — avoid getting updates from your local law enforcement. But you’re not told you’re also sharing your friends’ info. One thing that is unclear to me is whether applications can see the content of my Facebook messages and other communications I make within the site. Content fits the definition (“any information provided by you and visible to you on the Facebook Site, excluding any of your Contact Information”) of information available to third party providers, but it would be quite shocking if this was being made available to third parties. In the US, intercepting a communication requires a warrant — pursuant to the 4th Amendment as well as ECPA, and accessing a stored communication requires court orders or warrants, depending on the age of the information. This is why I’m skeptical that content is being shared with law enforcement via the API. It would be quite a scandal.